ORLANDO, FLORIDA – October 25, 2015. On a cloudy Saturday morning, with the booth ready to go, the Neofluidics team began its day in booth 2066. With the established 96 well plate already set in the minds of researchers, executives, and innovators alike, the Neofluidics team had a revolutionary research paradigm set in motion. The NeoPlate™ system maintains its integrity in replacing the conventional micro-well plate by obtaining equivalent results for research done on the archetype. Just as biochemical assays, cellular culture, and drug development is done on the conventional well plate, the NeoPlate™ proved to be not only as practical but more efficient. With an operating volume at scales less than 2000 times the volume used in the 96 wells, the amount of work done that can be potentially done on a NeoPlate™ is thus widely expanded. This innovative engineering-driven well plate system lends its capabilities to its design. Due to this well plate being closed as opposed to an open system, this encompasses factors which increase sensitivity for various assays. 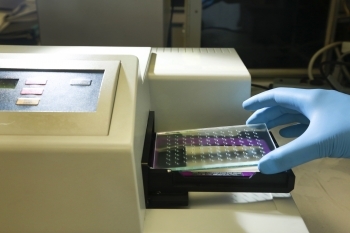 Such an example would be the ELISA, by increasing the surface area to volume ratio, the NeoPlate™ provides a lowered detection limit due to its 3D confirmation. The closed system also allows for a one-step serial dilution, which only requires a dilution calibration chart eliminating the need for extraneous buffer and reducing the waste of costly reagents. This state-of-the art well plate ensures a robust and precise pipetting method that will always maintain the volume specified. Expanding their horizons, the NeoFluidics team has already begun developing an elegant method to single cell capture and analysis. This methodology will greatly expand the potential of cancer immunotherapeutic development and targeted genomic studies. 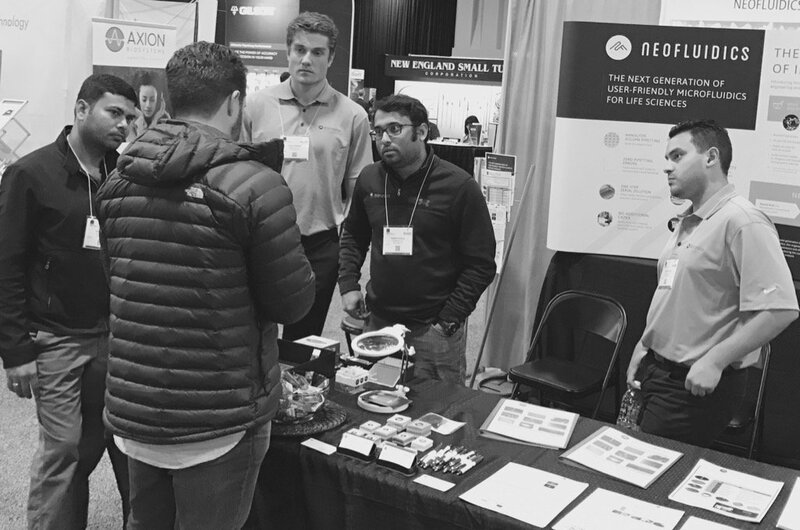 Partnering with labs at UCSD, MIT, Texas Tech, and Arizona State University, the NeoFluidics team has already engineered and optimized protocols to modernize this user-friendly microfluidic platform. While their operating volumes may be small, their ambition and agenda remains ever large. As passerbys looked over at the booth, they found a menagerie of promotional items ranging from pens, post-its, and patented samples. As they made their way over, politely saying “Hello, what do you have here?” they soon realized that this Carlsbad based company had more than just promos to offer.